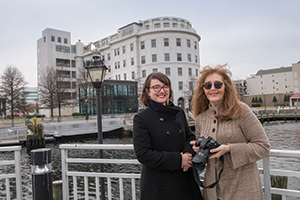 Armed with cameras, creativity and a love for Portsmouth, Betty Sanborn and Niki Park are on a mission to promote pride in the historic Hampton Roads city they call home. Professional photographers, Sanborn and Park travel throughout Portsmouth taking portraits of residents and placing them on The People of Portsmouth Facebook page along with why they love living in the city and their vision for its future. Sanborn and Park’s attitude is indicative of a fresh start many in Portsmouth are trying to make this year after recent turmoil in city government and the damaging financial effects of new transportation tolls. City officials point to positive signs, including new investment in multifamily real estate projects, potential development of the city’s waterfront and an influx of new downtown residents. Portsmouth also has taken a major financial hit in the two years since tolls were levied on the Downtown and Midtown tunnels to help pay for the $2.1 billion Elizabeth River Tunnels project, Virginia’s largest road-building project in 20 years. The deal, approved by the administration of then-Gov. Bob McDonnell has been harshly criticized by the current governor, Terry McAuliffe. The tolls, along with regular nightly and weekend closures of the downtown tunnels, have riled motorists and business owners. Norfolk and Virginia Beach residents have shunned the tunnels, curtailing travel to Portsmouth and dampening sales for local businesses. Some closed their doors, including Crockin’s Furniture which is shuttering its downtown store after 126 years. These are some of challenges that Pettis Patton has faced since starting work as Portsmouth’s first female city manager Sept. 1. 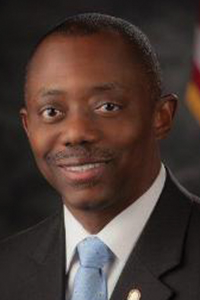 Council’s unanimous choice for the job, Pettis Patton previously spent 22 years in city hall, overseeing an array of departments before retiring as deputy city manager in 2008. She then spent seven years as associate director for student access, success and diversity initiatives at the Illinois Institute of Technology in Chicago. It’s a philosophy she imparts not only to rank and file employees but also to department heads, including those appointed late last year to fill seven vacant positions. 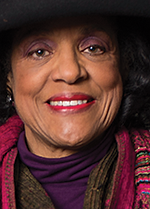 To enhance city government’s connection with residents, she is requiring department heads to meet with every civic association during 2016. Elie Bracy III also has faced challenges since becoming superintendent of Portsmouth Public Schools a year ago. The former superintendent of rural Weldon, N.C., schools took the helm of an urban division in which enrollment has declined during the past 20 years to about 14,000 students. Six of the system’s 19 elementary, middle and high schools currently have partial accreditation. The rest are fully accredited. The city’s storied past dates from 1608 when Capt. John Smith surveyed land along a body of water, which he named the Elizabeth River. Today, Portsmouth’s economic development department touts the city’s 90 miles of shoreline, which played a vital role in the nation’s maritime and military history. 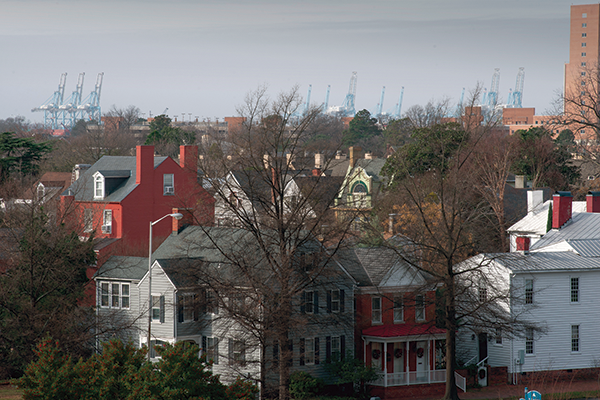 The Norfolk Naval Shipyard was established in Portsmouth in 1767, while the U.S. Fifth District Coast Guard Command provides maritime protection for the mid-Atlantic U.S. Portsmouth is also home to the U.S. Naval Medical Center, the Navy’s oldest, continuously operating hospital, in use since the 1830s. Many of the workers at those facilities commute from other cities. Housing in the city has largely consisted of small, single-family homes and low-end apartment complexes, with 60 percent of residences built before 1970. That’s one reason city leaders are enthused about the addition of eight developments totaling 770 multifamily units in the downtown corridor, representing $100 million in private investment. The Quarters at Park View, a 140-unit luxury apartment community that opened last summer, is fully occupied. Its developer, The Whitmore Co., also is constructing two other apartment complexes in Olde Towne. Meanwhile, the Monument Cos., a Richmond firm specializing in rehabbing historic properties, is converting the former Seaboard Building and the Governor Dinwiddie Hotel into high-end apartments, with commercial space on the first floors. Work should be completed by the end of 2016. The Breeden Co., based in Virginia Beach, is making its first foray into Olde Towne with the construction of two downtown apartment projects. The 134-unit Harbor Vista will be ready this summer, while the 187-unit North Pier, next to the city’s Harbor Center Pavilion, is scheduled for completion in 2017. The company has also purchased Montgomery Square, a 69-unit property with 40,000 square feet of commercial space. Promoted as a tourist destination, Olde Towne boasts one of the largest collections of historically important homes between Alexandria and Charleston, S.C., as well as historic places of worship, including Monumental United Methodist Church, one of the oldest continuing Methodist congregations in the South, and Emanuel African Methodist Episcopal Church, the second oldest building in Portsmouth and the oldest black church. 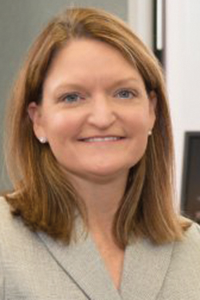 Butler officially took over the city’s top economic development job in December after working in the department for two decades. She’s seen the city evolve and is bullish about its future. “We’ve come a long way, and there is nothing but opportunities ahead of us,” she says. For starters, the city is working to attract more maritime and port-related industries and retail and restaurants and even craft breweries. Two of Virginia’s three container terminals are in Portsmouth, and the state’s long-term plans call for developing the city’s Craney Island as a container terminal. “Clearly the port business is part of Portsmouth,” Butler notes. “Businesses want to be in or near port terminals or on the waterfront.” Interchange, a logistics company based in Harrisonburg, is building two 100,000-square-foot warehouses on 13 acres in Portsmouth, while PER Properties of Virginia Beach is developing about 15 acres along the Elizabeth River for storage and shipment of agricultural products. Retail is once again flourishing in Portsmouth, reversing a trend that saw many stores leave the city for suburban shopping centers. Developers have poured $37 million into Midtown’s resurgence, where a Kroger Marketplace, a Wal-Mart store and national eateries are drawing shoppers. “Over the last five to 10 years, we’ve made a concerted effort to bring retail back,” Butler says. Yet, Portsmouth is regularly perceived as Hampton Roads’ underdog, says Park, the photographer, a city native who moved back 14 years ago. “I happen to be a fan of underdogs,” she adds. Discovering that others were also rooting for Portsmouth, Park brought together a group of friends and acquaintances to brainstorm ways to improve the city. The conversation led to the formation of Create Portsmouth Now to highlight residents’ creativity, talent and entrepreneurship and instill pride in the community. The group sponsored a fall festival featuring bands and artists and is planning a spring event as well as an initiative to display local artists’ work in storefront windows and on a public art wall in Olde Towne.